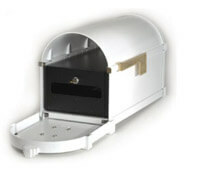 Click here to view all color options for this mailbox. See DisclaimerFor use ONLY with Keystone Series Mailboxes - not intended to fit other mailboxes. 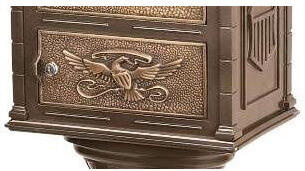 The Keystone Series Mailbox features a polished, classic look with distinctive, high-quality, stylish details and a highly functional design. 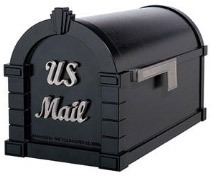 Hand-crafted of aircraft-grade aluminum with a rich, powder-coated paint finish and solid brass details, the Keystone Mailbox, Post and accessories provide years and years of maintenance-free durability and seamless operation. Alongside superior style and function, the optional locking insert offers security and protection from mail and identity theft. 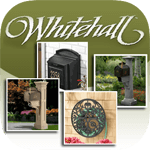 And with 27 beautiful design, color, and finish options to choose from, there is a Keystone Mailbox to perfectly complement any home or building structure. The Keystone Series Standard Post is the ultimate addition to the Keystone Series Mailbox and creates a beautiful, functional and seamless mailbox presentation. 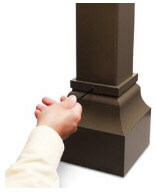 The Standard Post features a top-mount system (no finial or versatile mounting arm) and can accommodate both the optional custom Standard Address Plaque (sold separately) and Decorative Post Cuff (sold separately). 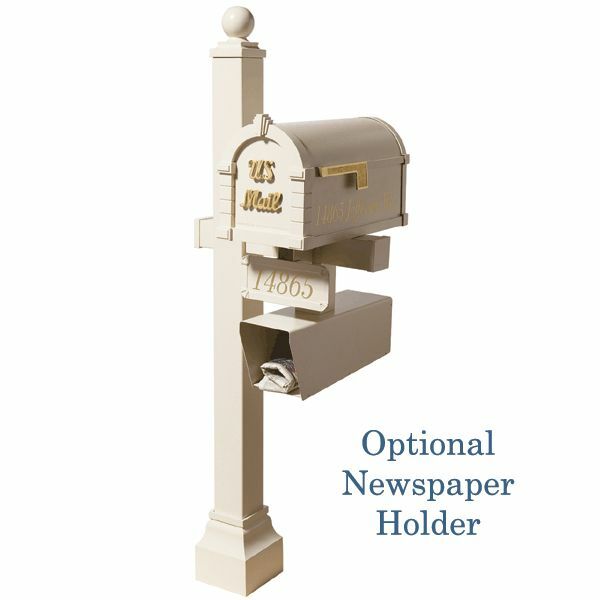 The optional Newspaper Holder, however, cannot be mounted to the Standard Post but only to the Deluxe Post. 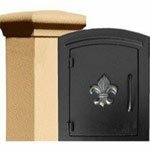 The Keystone Series Deluxe Post is the ultimate addition to the Keystone Series Mailbox and creates a beautiful, functional and seamless mailbox presentation. 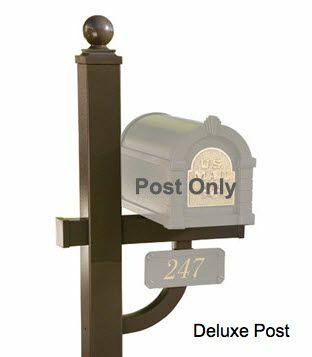 The Deluxe Post features a curved brace, ball finial, decorative post cuff, and versatile mounting arm that allows for left, right or front mailbox mounting, creating optimal accessibility. The Deluxe Post can also accommodate the personalized Deluxe Address Plaque (pictured, sold separately) and Newspaper Holder (sold separately). 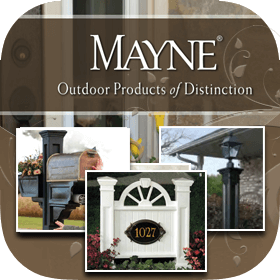 Keystone Series Multi-Mount Posts provide the perfect solution to meet the needs of home builders, HOAs, businesses and landscape architects alike while creating beautiful and distinctive presentations that complement any building structure. 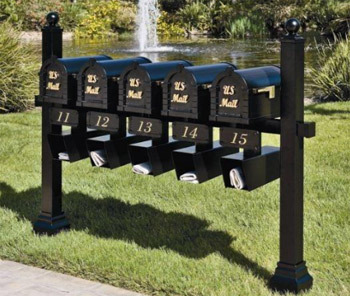 Keystone Series Multi-Mount Posts offer the ultimate flexibility in multiple mailbox mounting options, as the extended mounting beams can continually bolt together to build one continuous display, from three mailboxes to one hundred mailboxes. 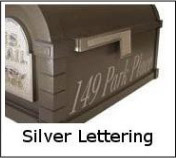 Further, all Multi-Mount Posts can accommodate custom address plaques and newspaper holders for each mailbox (pictured, sold separately), and decorative post cuffs (pictured, sold separately), allowing each addressee a personalized and highly functional mail experience. The Keystone Series Double Deluxe Post features a vertical post with ball finial, two mounting beams, two curved braces and a decorative post cuff, creating a beautiful and functional presentation for two Keystone Series Mailboxes. 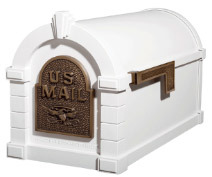 The Double Deluxe Post can also accommodate two custom address plaques (pictured, sold separately) and two newspaper holders (sold separately), allowing for superior delivery accuracy and personalization. The Keystone Series Triple Post features two vertical posts with ball finials and an extended mounting beam, creating a beautiful and functional presentation for three Keystone Series Mailboxes (sold separately). 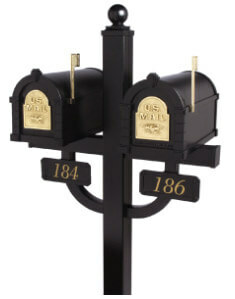 The Triple Post can also accommodate three custom address plaques (pictured, sold separately), three newspaper holders (sold separately), and two decorative post cuffs (sold separately), allowing for superior delivery accuracy and personalization. 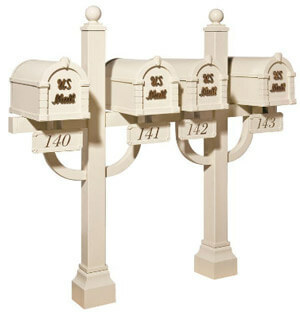 The Keystone Series Triple Deluxe Post features two vertical posts with ball finials, an extended mounting beam, two curved braces, and two decorative post cuffs, creating a beautiful and functional presentation for three Keystone Series Mailboxes (sold separately). 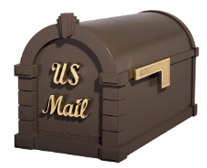 The Triple Deluxe Post can also accommodate three custom address plaques (pictured, sold separately) and three newspaper holders (sold separately), allowing for superior delivery accuracy and personalization. 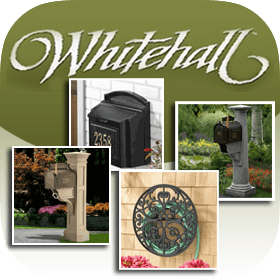 The Keystone Series Quad Post features two vertical posts with ball finials and an extended mounting beam, creating a beautiful and functional presentation for four Keystone Series Mailboxes (sold separately). The Quad Post can also accommodate four custom address plaques (pictured, sold separately), four newspaper holders (sold separately), and two decorative post cuffs (sold separately), allowing for superior delivery accuracy and personalization. 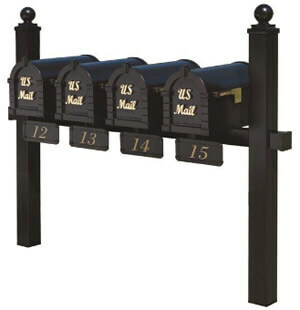 The Keystone Series Quad Deluxe Post features two vertical posts with ball finials, an extended mounting beam, two curved braces, and two decorative post cuffs, creating a beautiful and functional presentation for four Keystone Series Mailboxes (sold separately). 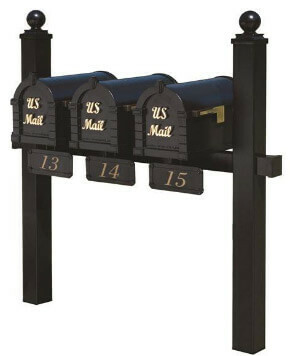 The Quad Deluxe Post can also accommodate four custom address plaques (pictured, sold separately), and four newspaper holders (sold separately), allowing for superior delivery accuracy and personalization. 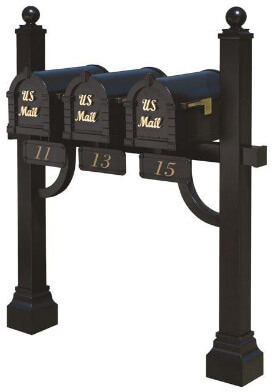 The Keystone Series Quad Deluxe Post (Inner Positioned) features two vertical posts with ball finials, three mounting beams, four curved braces, and two decorative post cuffs, creating a beautiful and functional presentation for four Keystone Series Mailboxes (sold separately). 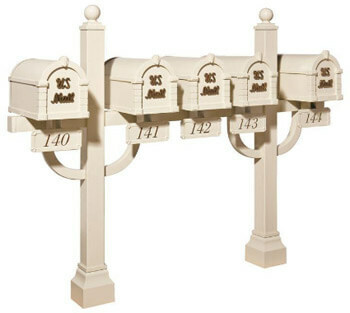 The Quad Deluxe Post (Inner Positioned) can also accommodate four custom address plaques (pictured, sold separately) and four newspaper holders (sold separately), allowing for superior delivery accuracy and personalization. 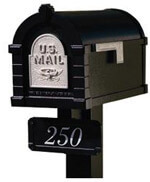 The Keystone Series Pentad Post features two vertical posts with ball finials and an extended mounting beam, creating a beautiful and functional presentation for five Keystone Series Mailboxes (sold separately). The Pentad Post can also accommodate five custom address plaques (pictured, sold separately), five newspaper holders (sold separately), and two decorative post cuffs (sold separately), allowing for superior delivery accuracy and personalization. 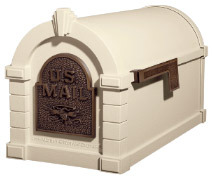 The Keystone Series Pentad Deluxe Post features two vertical posts with ball finials, an extended mounting beam, two curved braces, and two decorative post cuffs, creating a beautiful and functional presentation for five Keystone Series Mailboxes (sold separately). 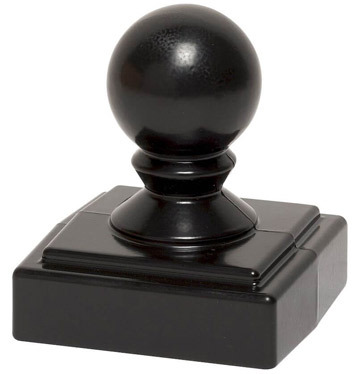 The Pentad Deluxe Post can also accommodate five custom address plaques (pictured, sold separately) and five newspaper holders (sold separately), allowing for superior delivery accuracy and personalization. 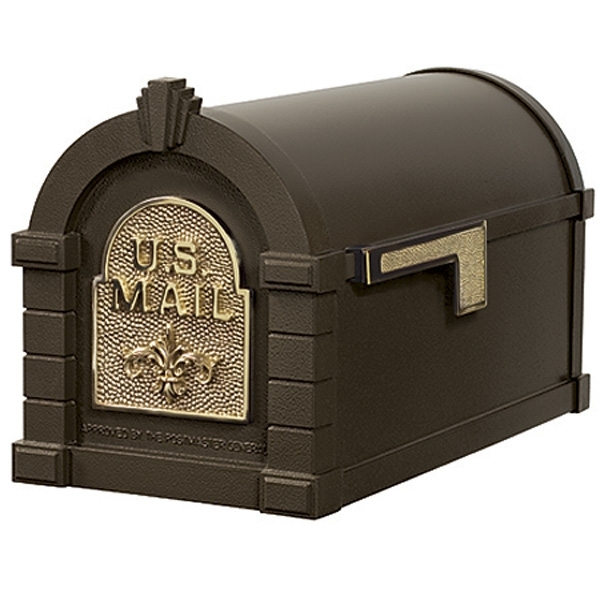 The Keystone Series Pentad Deluxe Post (Inner Positioned) features two vertical posts with ball finials, three mounting beams, four curved braces, and two decorative post cuffs, creating a beautiful and functional presentation for five Keystone Series Mailboxes (sold separately). 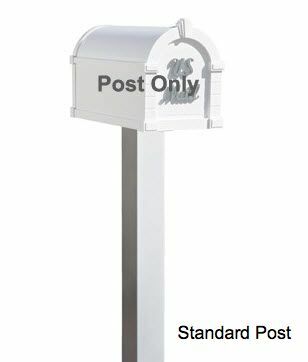 The Pentad Deluxe Post (Inner Positioned) can also accommodate five custom address plaques (pictured, sold separately) and five newspaper holders (sold separately), allowing for superior delivery accuracy and personalization. 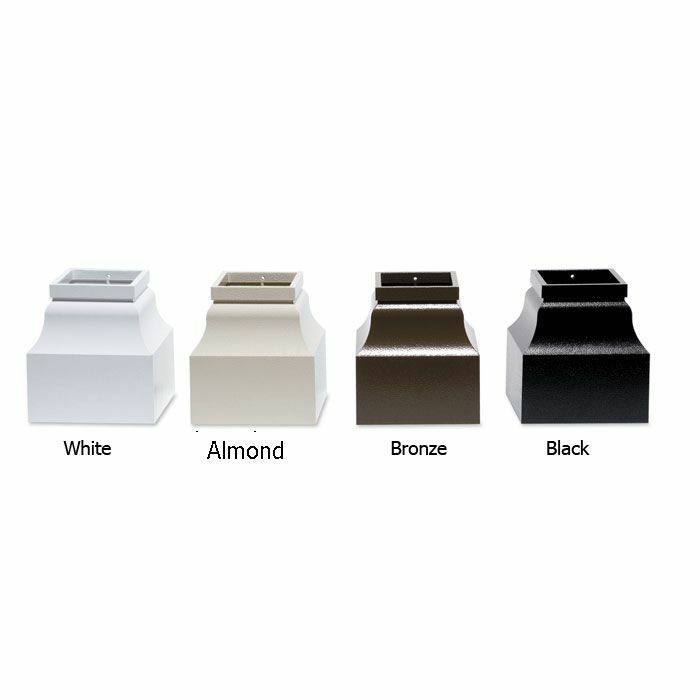 All Keystone Series mailbox and post accessories are available to match your chosen finishes and are constructed of the same aircraft-grade aluminum with rich, powder-coated paint finish as the rest of the Keystone Series for superior style and durability. 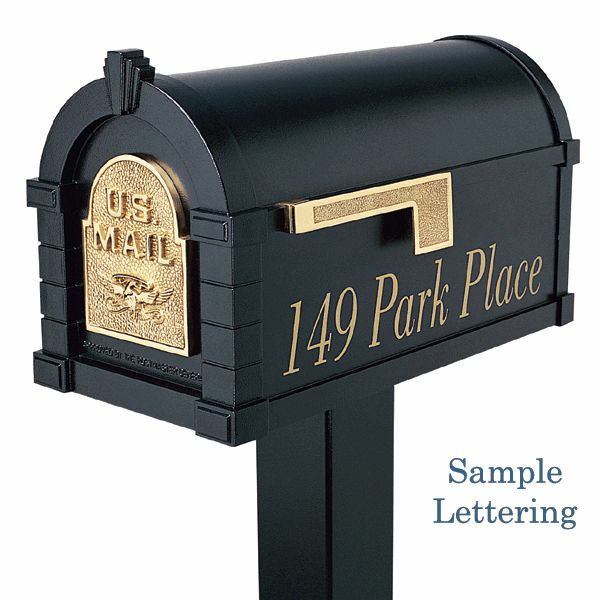 Compatible with the Keystone Series Standard Post, the powder-coated aluminum Standard Post Address Plaque features up to six gold, silver or bronze marine-grade ultraviolet-resistant vinyl characters to easily identify your address. 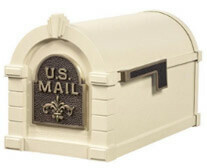 It is a stylish option that adds to the aesthetic quality of your mailbox while ensuring postal delivery accuracy. The plaque attaches simply and securely to any new or existing Keystone Series Standard Post, and each kit includes a mounting bracket, plaque, and mounting bolt. 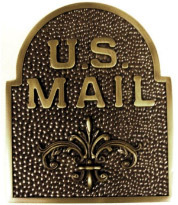 Compatible with the Deluxe Post, Double Deluxe Post or Multi-Mount Post, the powder-coated aluminum Deluxe Post Address Plaque features up to six gold, silver or bronze marine-grade ultraviolet-resistant vinyl characters to easily identify your address. 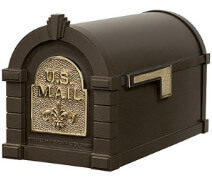 It is a stylish option that adds to the aesthetic quality of your mailbox while ensuring postal delivery accuracy. The plaque attaches simply and securely to any new or existing Keystone Series Post, and each kit includes a mounting bracket, plaque, and mounting bolt. Never again settle for a soggy Sunday edition or a wayward gazette! The heavy-duty, all aluminum Keystone Series Newspaper Holder mounts to the Keystone Deluxe Post, Double Deluxe Post or Multi-Unit Post (not the Standard Post) and ensures your publications arrive just where you like them. The Keystone Series Decorative Post Cuff is a stylish addition to your mailbox post, offering the perfect finishing touch to your mailbox presentation. Crafted of the same rust-proof, powder-coated aluminum as the post, the cuff fits all Keystone Series posts and easily installs in seconds. Do you have identity theft or privacy concerns? 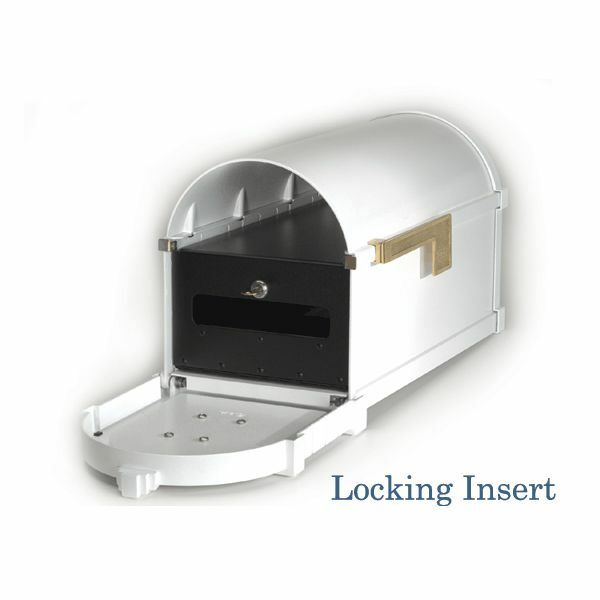 The Keystone Series locking mailbox insert is an invaluable defense against intruders. 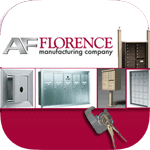 Boasting a strong, 100% stainless steel lock, the lockbox is easy to install (the lockbox simply slides into the front of the mailbox and secures with a single screw) and can be added to any new or existing Keystone Series Mailbox. Each locking insert includes two coded keys. Please check with your local postal carrier to determine if the locking insert option is acceptable in your area. 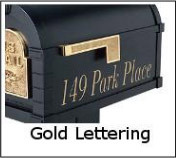 Add your address, name, or custom wording to the side of your Keystone Series Mailbox with customized marine-grade ultraviolet-resistant vinyl lettering (up to 20 characters) in gold, silver or bronze. 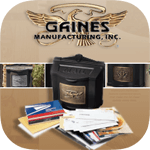 Gaines Manufacturing offers only the highest quality materials and craftsmanship, resulting in mailboxes, posts, and accessories that raise the standard in the industry. Made in the USA, Gaines products are meticulously hand-crafted and hand-assembled, combining elegance and functionality in the most beautiful way. Excellence is synonymous with the Gaines brand. 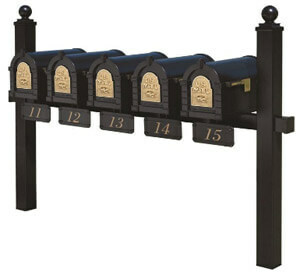 Gaines offers numerous styles, colors, finishes, options and accessories to fit your residential or commercial needs, from a simple mailbox to a beautifully embellished multiple-mailbox configuration with matching posts, address plaques, newspaper holders and custom lettering. 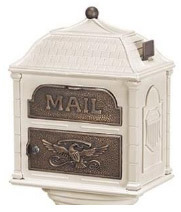 From classically simple to beautifully detailed, there is a Gaines mailbox combination that will perfectly complement the architecture and color of your home, office or building. Are you worried about mail theft or even worse, identity theft? We lead busy lives, and we cannot always check our mail as quickly as we should. 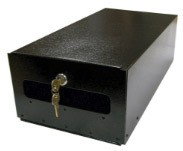 Gaines has met security demands with the locking lower access mail door of the Classic Mailbox and the optional locking insert of Keystone Series and Janzer Mailboxes that keeps your mail secure until you retrieve it, as well as the optional high security option of the Classic Mailbox that restricts an unwanted hand from entering through the mail depository opening. Gaines is committed to offering the utmost in style and functionality while protecting your belongings and sensitive personal information. 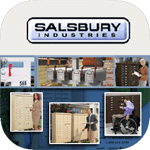 The installation of Gaines mailboxes, posts and accessories is always simple. The entire Gaines line of products includes clear, easy-to-follow instructions as well as all mounting hardware. Its strong architectural design distinguishes the Gaines mailbox, post or accessory as a statement of quality, style, and durability. The unique, eye-catching designs and timeless finishes will make an excellent first impression and add considerable aesthetic value to your home. 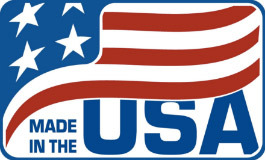 Gaines products are proudly made in the USA. 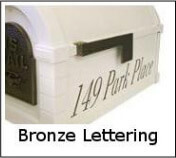 Mailboxes, posts, and accessories are die cast from aerospace-grade, rust-proof aluminum (Janzer Series Mailboxes are crafted out of rust-resistant galvanized steel) and finished with a state-of-the-art, five step powder coating paint process, offering an incredibly durable and highly protective finish that will withstand all weather and environmental conditions for years and years to come. The A360 rust-proof cast aluminum is extremely sturdy and lightweight at the same time. The cast aluminum is formed by pouring aluminum into a mold of the end product. During the manufacturing process, the aluminum is subjected to substantial amounts of pressure, which produces an extremely dense material that can withstand even the harshest of conditions. A five-stage, powder-coated paint process is expertly utilized to ensure a consistent, durable and high-quality finish. The paint itself contains ultraviolet (UV) ray inhibitors that protect the surface, therefore making it resistant to wear such as chipping, scratching and fading and providing years of enjoyment and use. 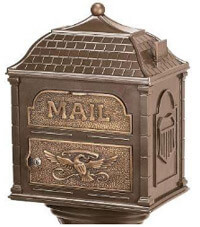 Gaines mailboxes, posts, and accessories feature only the finest quality materials, such as stainless steel hardware and solid brass accents. As with any brass elements, you can joyfully expect them to tarnish and age over time. Most people appreciate the natural beauty of this process; however, there are steps you can take to slow down or reverse the natural patina process. 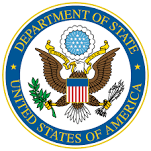 The degree of the aging or patina is affected by a multitude of both environmental and artificial elements. 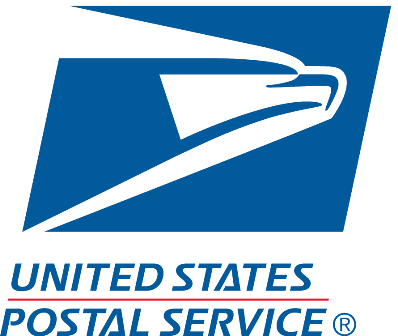 All Gaines mailboxes, posts, and accessories are approved by the U.S. Postmaster General. 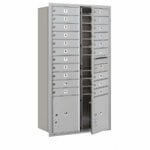 However, check with your local postal carrier to determine if the locking insert options are acceptable in your area. Replacement parts for new and newer Gaines models can be purchased through the manufacturer at GainesDirect.com. Gaines Manufacturing, Inc. proudly warrants that its products shall be free from defects in material and workmanship for the period of one (1) year from the date of purchase. 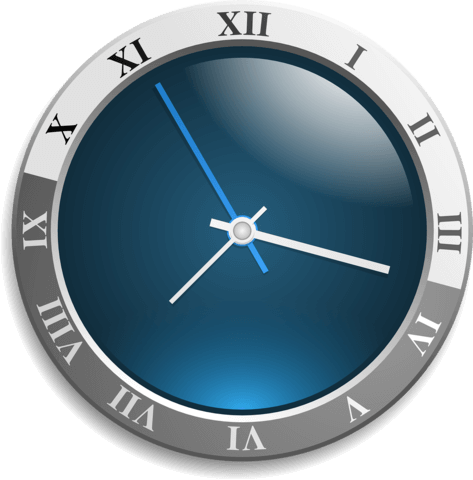 We will promptly assist customers in the event that they are unsatisfied with their purchase, and we will make every effort to resolve support cases with the customer directly. So, think of the Google Trusted Stores stamp as more than just a marketing icon. It's the assurance that we will go the extra mile to resolve your support case, according to our company policies.